INDOOR AIR QUALITY IS NOT ALWAYS TOP OF MIND FOR HOMEOWNERS; however it is one of the main culprits in homes for the cause of allergens. According to Lori Topiel, owner of COIT Cleaning and Restoration of South Jersey, bacteria, dust, pet dander, pollen, lint and other potentially harmful debris can collect and live in your home’s air ducts. Energy efficiency is another reason to have your air ducts cleaned regularly by professionals. When your HVAC system is clean it also runs more efficiently, saving you money on your energy bills. 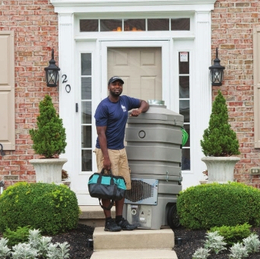 The same is true for dryer vents—an area often overlooked by homeowners. “Your clothes will dry in less time and the dryer will run less often,” says Topiel. COIT cleans approximately 10,000 clothes dryer vents each year. In a typical home with average clothes dryer use, approximately a half pound of lint is removed after a cleaning. If you find that your clothes are taking too long to dry, lint is falling out of the dryer when removing clothes or that the exterior flap barely opens when the dryer is running, the dryer vent is likely clogged. “But perhaps the most important reason for cleaning clothes dryer vents is to prevent housfires,” says Topiel. Approximately 15,000 home fires occur each year in the United States as a result of clothes dryer fires. In many cases the dryer fire spreads and damages other parts of the home or can potentially cause a total loss of the home. “Peace of mind is an essential reason to have your home’s air ducts and clothes dryer vents cleaned by a professional,” she adds.